Astringency, which is a dry, vinegar like off-flavor in your beer, can be caused by oversparging or sparging your grains too hot while brewing. This week I take a look at astringency, oversparging and sparging your grains too hot. 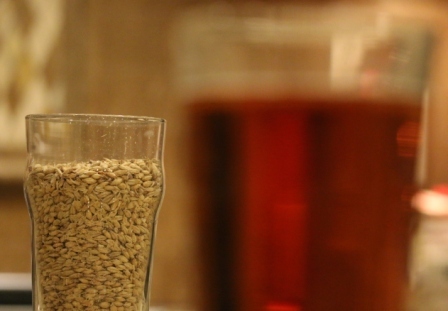 Astringency in the finished beer is usually the result of excess tannins extracted from the grains during the sparge process. Tannins are a phenolic category of polyphenols that naturally occur in grain husks. During the mash and sparge you can extract excessive tannins which will affect the flavor of your beer. One potential cause of astringency is crushing your grains too fine. In particular if you crush the husks to a fine powder it can result in excessive tannin extraction. Usually this is the result of using a “flour mill” or corona type mill or simply setting the mill gap to be too narrow. A proper crush will finely crush the grain core but leave large pieces of the husk intact. That’s why I recommend using a dual roller mill. A dual roller mill will crush the grains but still leave large pieces of husk intact. Another risk factor is simply mashing with the pH too high. Your mash pH should be in the 5.2-5.5 range after mixing in the grains. If the mash pH is too high, more tannins will be extracted into your beer. In particular, pH levels above 6.0 during the sparge are associated with tannin extraction. You can use a variety of methods to measure and adjust your mash pH to keep it in the desired range. This is primarily a problem in lighter colored beers as dark grains are acidic and tend to drive the mash pH down. Water tends to drive the pH of the mash higher, and grains (particularly dark grains) will lower the mash pH. So if we look at the case where we’re mashing in the proper pH range, it is pretty easy to see that as we run more water through the grain bed during the sparge, the pH of the runnings will go up over time. Similarly as we extract more sugars from the mash the gravity of the runnings will go down. So as the pH of the mash runnings go up and gravity of the runnings go down we again run the risk of extracting tannins near the end of the sparge. In particular pH levels above 6.0 and running gravity readings below roughly 20% of the target gravity are associated with tannin extraction. The most common method to avoid oversparging is to monitor the gravity of the runnings and stop sparging when the gravity falls below 1.008 for an average strength beer. Obviously that number would be higher or lower if brewing a very high gravity or low gravity beer. Some brewers with a pH meter also have the option of monitoring the pH of the runnings and stopping when the pH rises above 6.0. Sparging at excessively high temperatures can also result in astringency in the finished beer. Sparging at a moderately temperature has some benefits as it improves the flow of wort through the grain bed. However sparging too hot will result in tannin extraction in the finished beer. The maximum temperature for sparging is 170 F (77 C). Sparging above that can result in tannin extraction. Some people do use higher temperature sparge additions, but only to raise the temperature of the mash as a whole during the initial phase of the sparge. In no case do you want to raise the grain bed or runnings above 170 F (77 C). Those are some suggestions for managing your mash and avoiding astringency. Thanks for joining me on the BeerSmith Home Brewing Blog. You can grab a trial version of BeerSmith from BeerSmith.com. Be sure to sign up for my newsletter or my podcast (also on itunes…and youtube…and streaming radio station) for more great tips on homebrewing. The other primary source of tannin extraction is not keeping your mash submerged for the entire sparge. The tannins are in a relatively protected region 2-3 cells thick in the husks. These cells hydrate during the mash and expand. As long as the hydrostatic pressure outside the husks is steady, the tannins stay put in the cells. If you keep 2-3 inches of water over the grain bed for the entire sparge, your extraction won’t be affected since you’ll have a laminar flow through your grain bed. If the water level drops below the surface of the grain bed, the pressure inside the 2-3 cell layers containing tannins is greater than the surrounding ares, and the tannins are forced into the wort. If the grain bed shouldn’t get over 170F, how are people able to do decoction mashing? It’s because pH is the main factor, not temp. Sparge as hot as you like as long as your pH is good. As to the comment above, I batch sparge, which means that the grain is not submerged for long periods during mash and sparge runoff. After doing that for 490 batches, I have found that it does not cause tannin extraction. Trust me, you do not want to sparge with too hot of water. I had read online that sparging with boiling water would increase efficiency. So I tried it, and 4 or 5 batches later and horrible astringent beer (one getting dumped), I went back to 185 degree water, and all has been good ever since. I had searched all over online to see if this was the case, and couldn’t find anything solid. That was before this article was posted. Now I know for sure…lesson learned.